Polaris India Pvt. Ltd., a wholly owned subsidiary of Polaris Industries Inc., the world leader in Off-Road and All-Terrain Vehicles, today launched the versatile all-new 2016 Indian® Scout® Sixty in Hyderabad at its dealership, Mahavir Deccan Auto Pvt. Ltd. The all-new 2016 Indian® Scout® Sixty is the latest addition to the Indian® Scout® line-up ,sharing many elements of the award-winning Indian® Scout® with a price point that brings legendary Indian Motorcycle® craftsmanship and world renowned Indian® Scout® performance within the reach of every rider. True to the craftsmanship, reliability and legendary agility of the Indian® Scout®, the all-new Indian® Scout® Sixty shares the identical chassis, suspension, brakes and core engine — all mated with a new 60 cubic inch engine. The silky smooth, easy-to- shift 5-speed transmission coupled with the 78 horsepower engine produces a whopping peak torque of 88.8NM @ 5800 RPM. 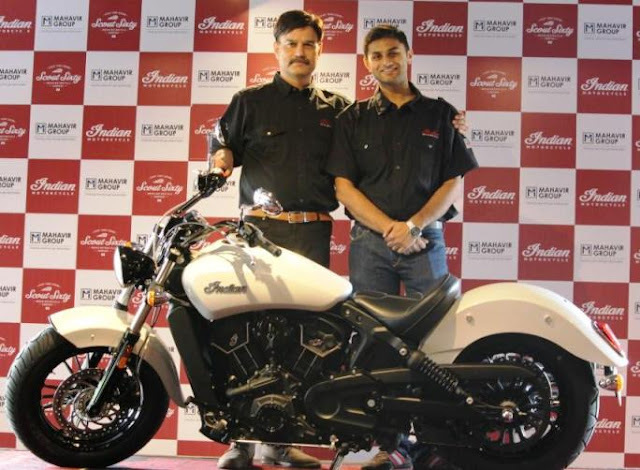 The bike was unveiled by Mr. Pankaj Dubey, Managing Director, Polaris India Pvt. Ltd along with Mr. Vikas Jhabakh, Director, Mahavir Deccan Auto Pvt. Ltd in a glittering ceremony. Speaking on the occasion, Mr. Pankaj Dubey, Managing Director, Polaris India Pvt. Ltd. said, “Hyderabad today is undoubtedly one of India’s most important economic hubs with a dominant presence of IT and ITES Industry. The launch of the new 2016 Indian® Scout® Sixty reiterates our promise of bringing the most fascinating motorcycles from Indian Motorcycle® stable to our valued customers in Hyderabad. The sharp economic growth of the city has raised the aspirations of people here, who want products which could compliment their lifestyle. The legendary heritage of the Indian® Scout® is carried forward in the all-new 2016 Indian® Scout® Sixty. “The response to Indian Motorcycle® in Hyderabad has been overwhelming. The all-new 2016 Indian® Scout® Sixty which is a stunning new addition to the Indian® Scout® range will surely create ripples among the biking enthusiasts of the city. At Mahavir Deccan Auto Pvt. Ltd., we are committed to provide global standards of after-sales and service support to add to the overall experience of owning this latest midsize addition from Indian Motorcycle®”said, Mr. Vikas Jhabakh, Mahavir Deccan Auto Pvt. Ltd.
A seat height of 25.3 inches allows for sure-footed comfort at stops, and the low center of gravity ensures agile cornering, precise balance and overall rider confidence and control. A series of accessories including seats, handlebars and foot peg re-locators allow the motorcycle to be tailored to fit each rider, while additional accessories such as saddlebags, laced front and rear wheels and quick-release windscreens give owners virtually unlimited freedom to customize their rides. The all-new Indian® Scout® Sixty will be available in three classic Indian Motorcycle® colors viz. Thunder Black, Indian Motorcycle® Red and Pearl White color with an expected price tag of Rs.12.21 lakhs (Ex-Showroom Hyderabad). Indian Motorcycle®, a wholly-owned division of Polaris Industries Inc. (NYSE: PII), is America’s first Motorcycle Company. Founded in 1901, Indian Motorcycle® has won the hearts of motorcyclists around the world and earned distinction as one of America’s most legendary and iconic brands through unrivalled racing dominance, engineering prowess and countless innovations and industry firsts. Today that heritage and passion is reignited in India. Polaris India brought the entire Indian Motorcycle Chief® range – Indian® Chief® Classic, Indian® Chief® Vintage, Indian® Chieftain®, and Indian® Chief Dark Horse® to India. The Indian® Scout®, Indian® Scout® Sixty and Indian® Roadmaster® are also available in India. Indian Motorcycle® has also started the Road Side Assistance Programme (RSA) and Extended Warranty (EW) Programme in India. Service coverage to the eligible vehicles - This coverage applies from KM 0.Understanding by “KM 0” is that the customer vehicle is covered from the moment customer starts or tries the vehicle, up to unlimited Kms. This service shall be provided only to immobilise Eligible motorcycles which have been covered under the Programme. Cochin (Coming Soon) and Kolkata (Coming Soon).